The response of the schools was overwhelming. We enjoyed great support of the Principals to our cause. They wanted their pupils to shed the math phobia which they had and since the vacations were fast approaching we managed to introduce over ten thousand students in about 10 schools to High Speed Vedic Maths. They were given workshops about the concepts and how exactly they could benefit out of these innovative methods. Students from Standards VIII and above attended. The Workshops were given by Mr. Williams along with yours truly. The heat in the climate and the soaring temperature brought us down physically but the applauds of the students to the methods shown always boosted our spirits up. I must mention the kindness and the hospitality shown by the schools during the heat wave in Kolkata. Ruth ensured everybody had water and were hydrated. We even managed to do two teacher's workshops where over 150 teachers from across Kolkata attended. This was organized at the Loreto House, Middleton Row and the session was taken by Prof. Williams. The teachers asked the same question again as to why wasn't this introduced in the school curriculum as the methods were beautiful and it was an innovative way to teach Math. The answer to this question we didn't know! Perhaps our educational system were too resistant to winds of change. Who Knows? But we were happy as long as the Math teachers were welcoming as they found it easier to use vedic maths to teach the kids! After these workshops we went on to do a series of our longer workshops where more of our techniques were discussed over a span of the next one month of the summer vacations where students are generally more relaxed. The students learnt the methods quickly and moved on from one technique to another grasping it. They involved themselves in presentations later on where they presented the techniques learnt creatively with the help of colours , charts and also poems about the methods. Their performance was measured and recorded and tips given as to how to make it better! Overall the last two months has been an amazing experience and we strive to continue our efforts to promote the system in other schools and colleges in the coming year. We are grateful and would like to thank Mr. Hemant Agarwal - our Director without whose support this series of talks would not have ever been made possible. We would also like to thank the respected Principals who supported and helped us in our endeavours. And last but not the least Mr.& Mrs. Williams whose continuing support and encouragement rocked the show. Learn school math four times faster. Math2020 shows you how to apply Vedic thinking to traditional Western methods. Covers mental math, arithmetic, algebra, geometry, trigonometry, calculus, statistics, and more. 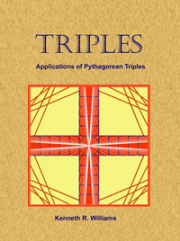 Ideal for home schooling, improving math grades, and overcoming math blocks. Example : 29 X 3 = 87. You can try this for 3 digit no ending with 9 multiplied with 1 digit no. Sujaritha's young daughter has sent us this neat method of multiplication. When you multiply duplex numbers by 9, then take a number from multiplicant and multiply it by 9 (multiplier), put the no. on either corner like this: 33 x 9 = 2 7. Then put 9 in the middle. This can be applicable for triplets numbers also. Ex: 444 x 9 = 3996. Here put the product of 4 and 9 like this: 3 _ _ 6. Then put 9's in the middle. Ex: 6666 x 9 = 59994. Here put the product of 6 and 9 like this: 5 _ _ _ 4. Then put 3 9's in the middle. Like this you can try for any number of digits. I met Mrs Sujaritha and her daughter last July and happened to give Amirthaa a puzzle - to insert the digits from 1 to 8 into a diagram consisting of eight boxes (not the one shown in the attachment). The idea is that two digits that are next to each other (like 4 and 5) cannot go next to each other in the diagram (diagonally also counts as 'next to'). Not only did Amirthaa solve this puzzle but she went on to develop it. She drew other systems of boxes containing 5 to 15 boxes each (see the attachment) and succeeded in inserting the first 5 digits into the set of 5 boxes, the first 6 digits into the set of 6 boxes and so on. The books are The Natural Calculator, Vertically and Crosswise and Astronomical Applications of Vedic Mathematics. The reviews, by Prof P. K. Srinivasan are rather old but we have just seen them and they are very positive.